Exclaim at what a wonderful year you’ve had and hope that next year will prove even bettter. A beautiful way to start your day. – scrambled eggs in a hot, buttery, duck fatty fat bath. Bacon first, set aside. Then eggs. Foie gras placed on the hot eggs to warm slightly. 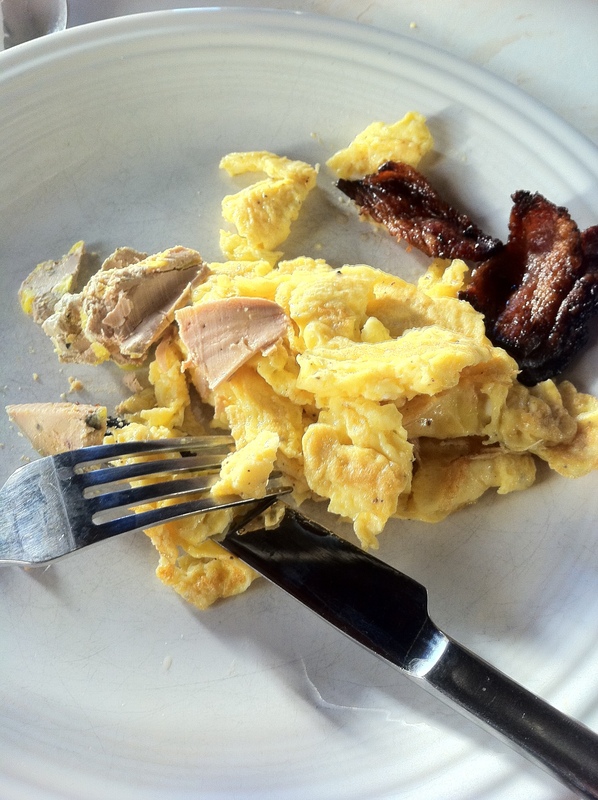 This entry was posted in Fun and Easy and tagged Bacon, cooking, Eggs, foie GRAS, food. Bookmark the permalink. Yes, enough about the pork. 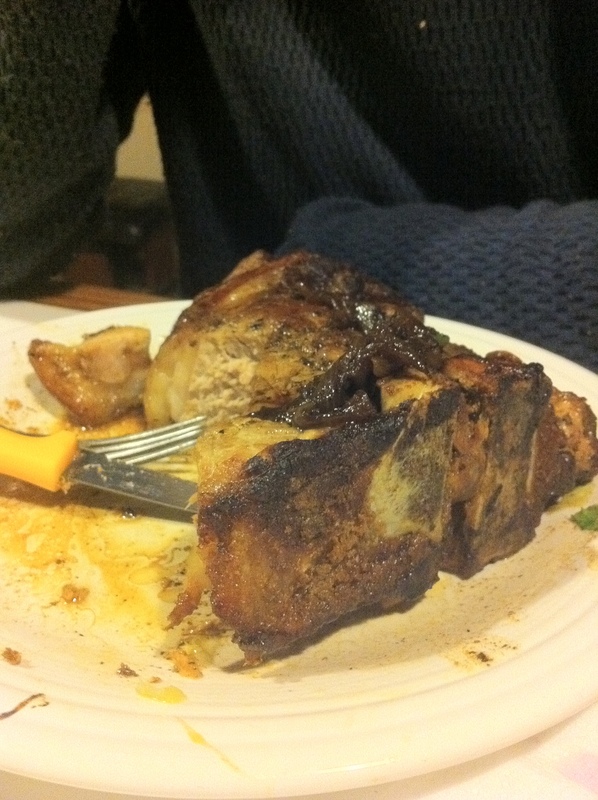 A mini, individual pork roast. Thankfully we have some eggs to welcome our leftovers. This entry was posted in Fleshy Bits and tagged cooking, food, pork. Bookmark the permalink. 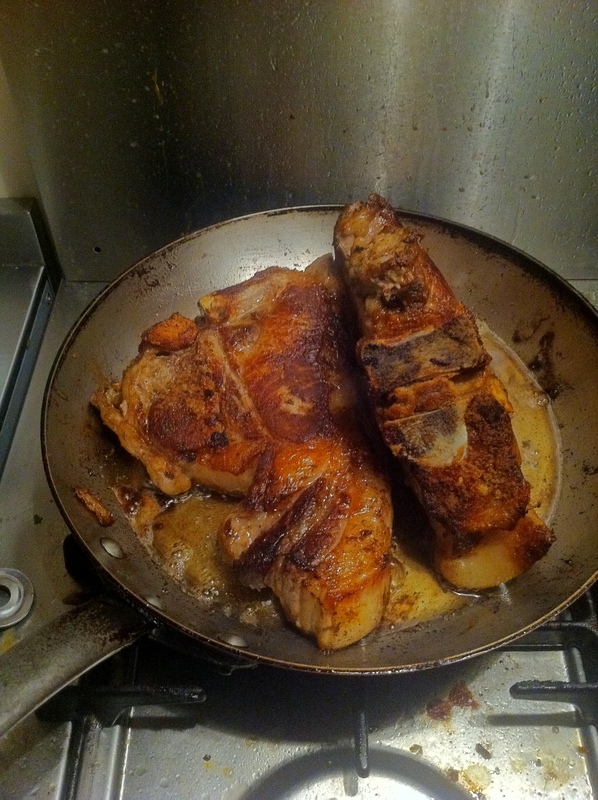 I feel that it is important for you to understand just how big these chops are and the space they occupy in my kitchen. This is my first time with a big arse chop. I’ve had fatty chops and large chops, but never a big arse chop. This is not the type of chop for a quick fry. I will fry and brown on all sides then stick in a moderate oven to finish off. I have huge drooly, anticipation that it will taste lovely. I’m working hard to get the texture right. 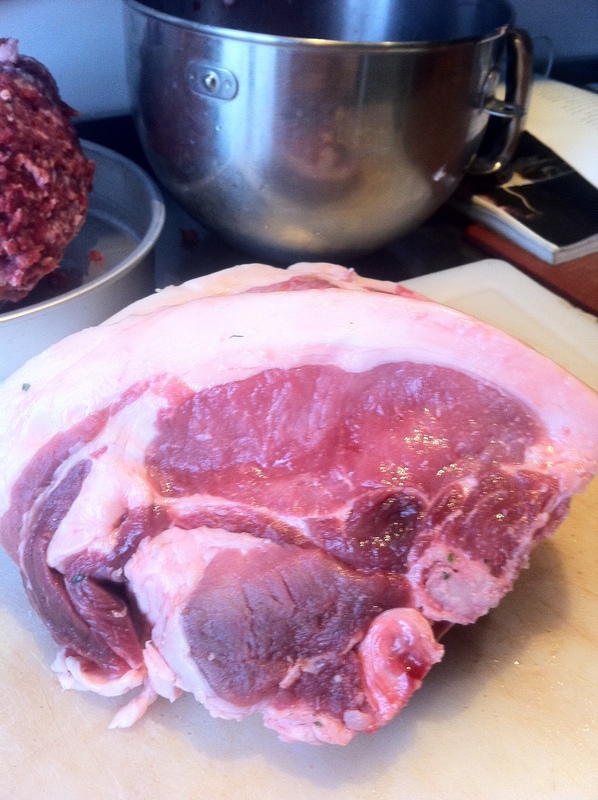 This entry was posted in Fleshy Bits and tagged chop, cooking, food, Pig, pork. Bookmark the permalink. Though an awesome name for an emerging investment banking firm, it’s actually a little dish to be served with some veal-roast-turn-curry. 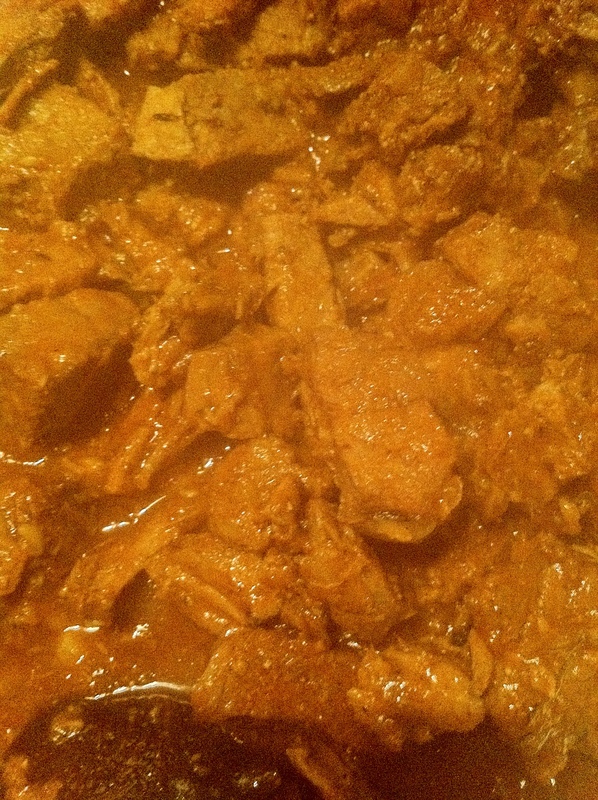 My ” ‘n’ sauce ” has evolved into some form of curry. I love curry and IT MUST be made from scratch. Absolutely no cheats or pastes allowed. 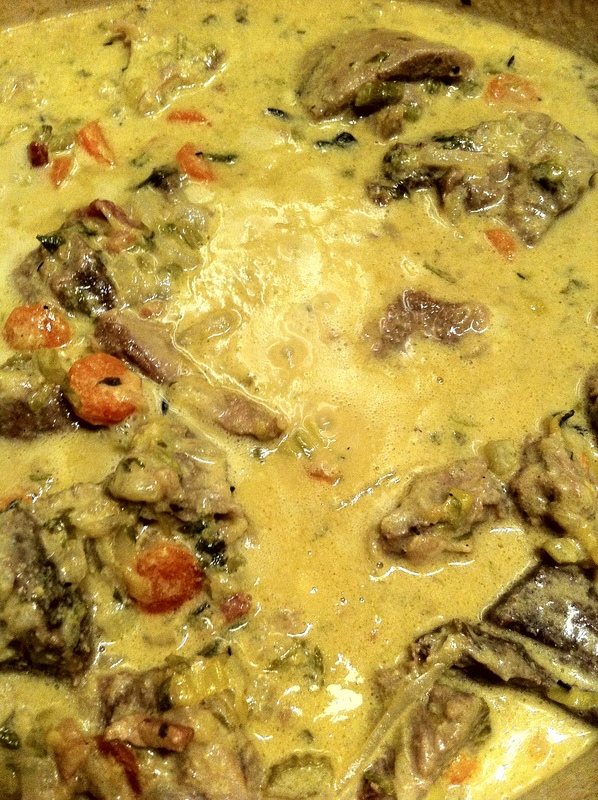 If you have leftover meaty bits, stick it in a curry. Cauliflower surprise works better than rice for rice. But if you ate the cauliflower, reach for pepper-fennel. Triple ‘A’ rating guaranteed. 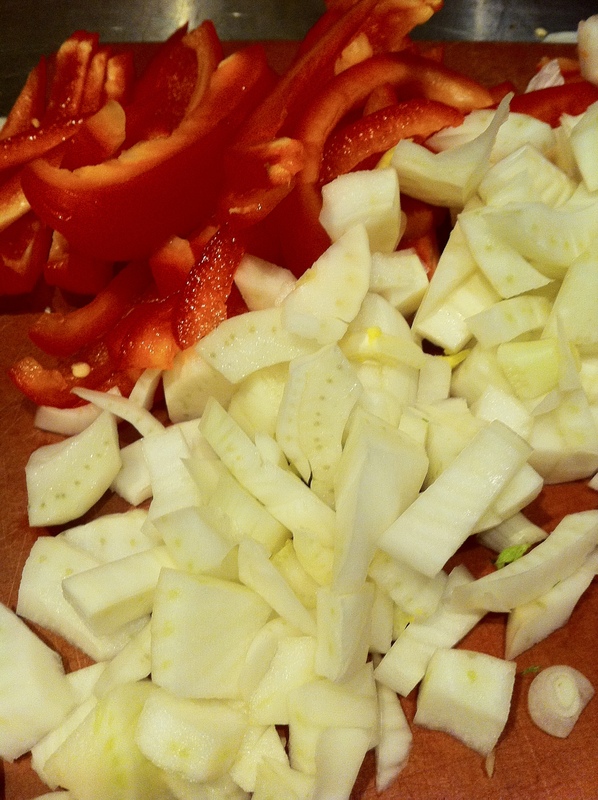 This entry was posted in Veg Head and tagged cooking, fennel, food, Pepper. Bookmark the permalink. A top sirloin awaits trial. 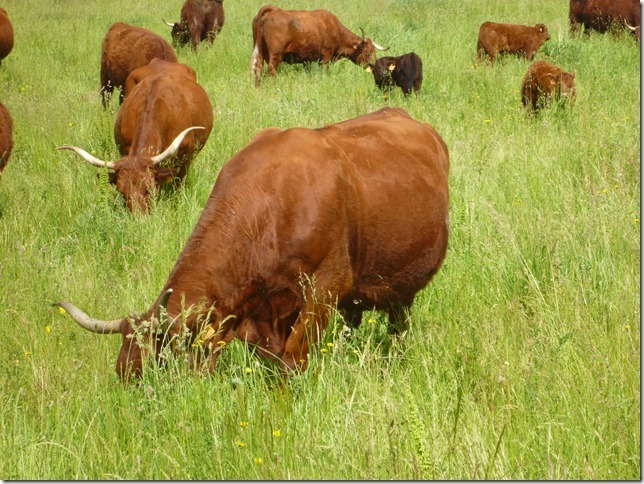 Another petit morceau for the farmers to taste. After the tender, tasty filet, I have high hopes for this meaty gem. 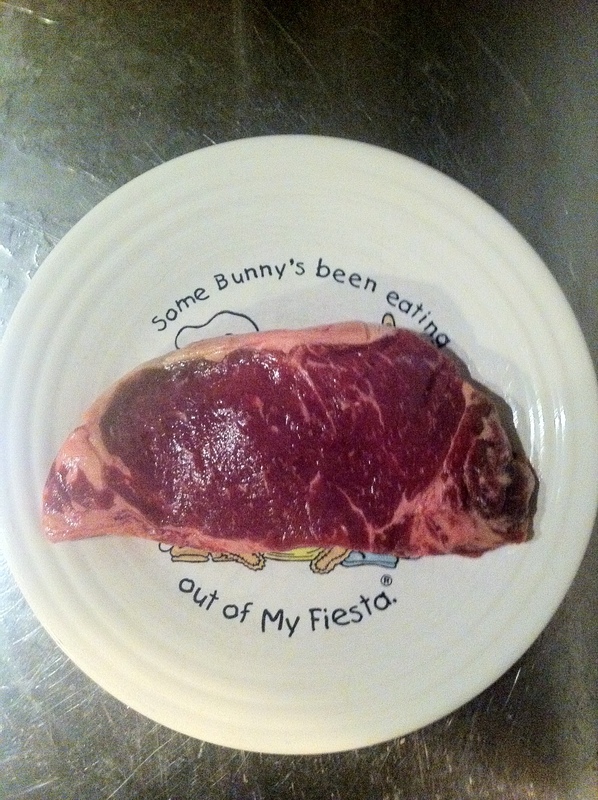 This entry was posted in Beef and tagged Beef, cooking, food, new York strip. Bookmark the permalink. 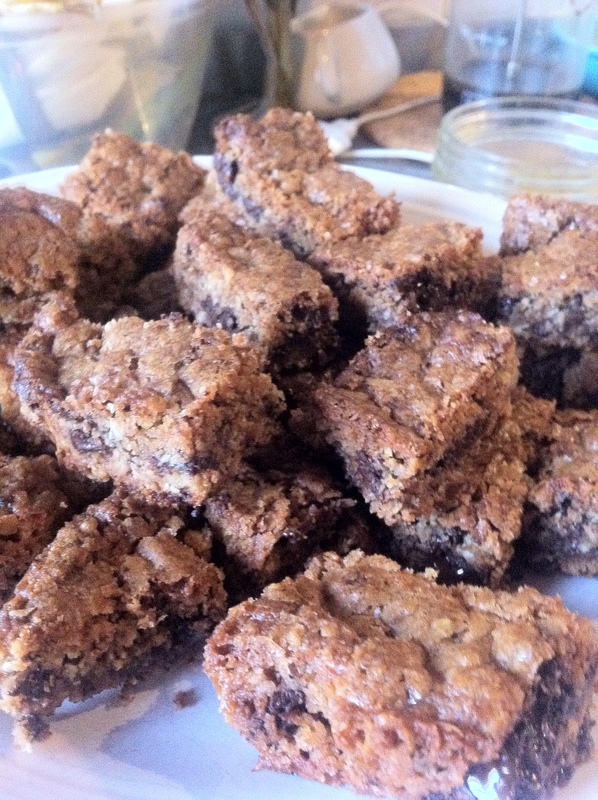 My baby girl made cookie bars. I have a hunch she upgraded to an oatmeal version. And they were yum. 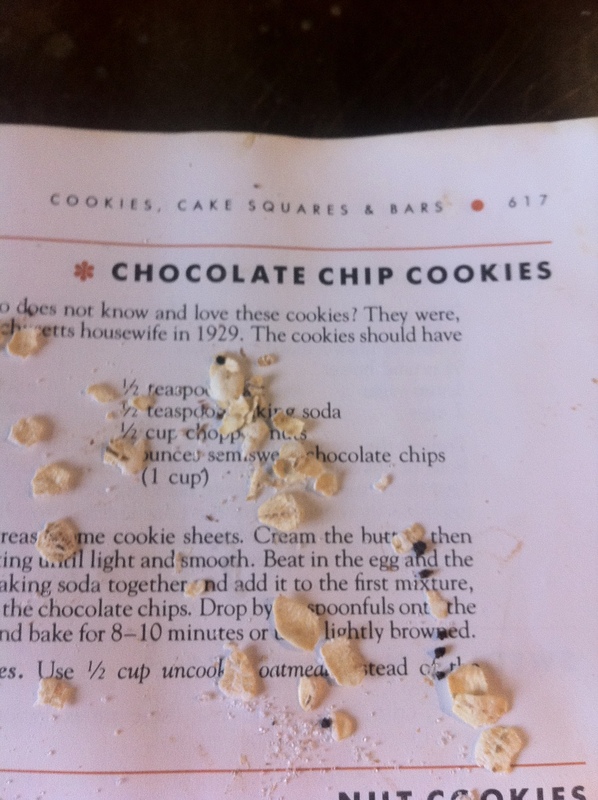 This entry was posted in Sugah and tagged cookies, cooking, food. Bookmark the permalink. Meet our latest offering. Last time, we sold the ground beef. Today, after weeks of dry aging, we have Christmas roasts and the good cuts. 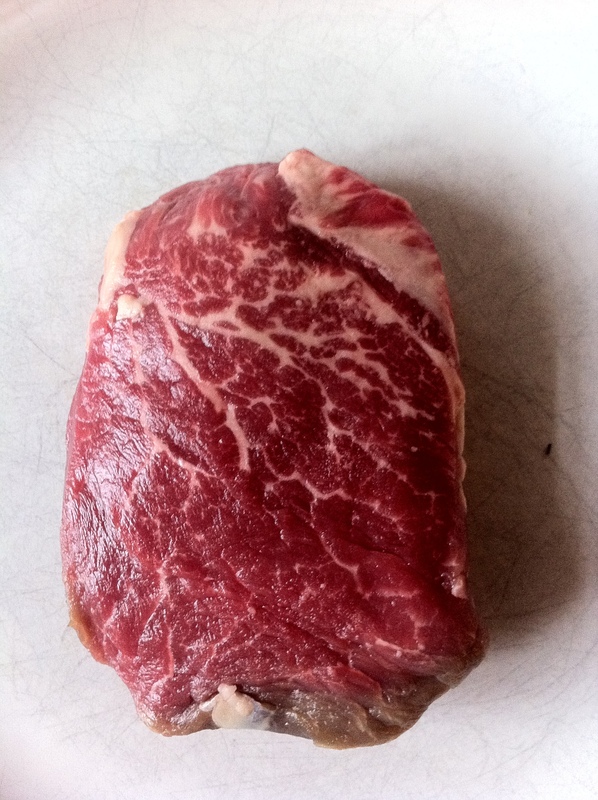 We were very pleased with the marbling on this grassfed cow. These beauties are all sold. As a farmer, you need to know your product. So we managed to find a small perk leftover to collect more knowledge on our march to tasty beef. 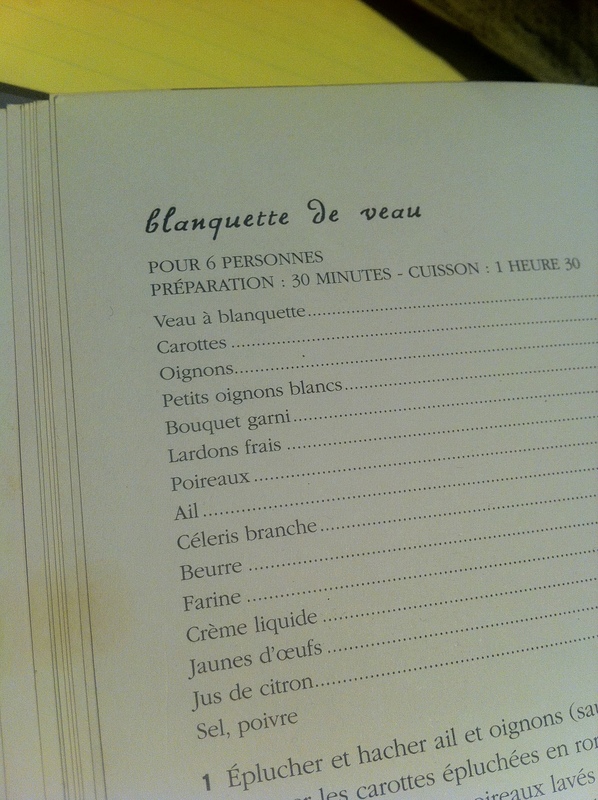 Yeah, I know, filet again? Ug. Us grasspunks take one for the team as necessary. 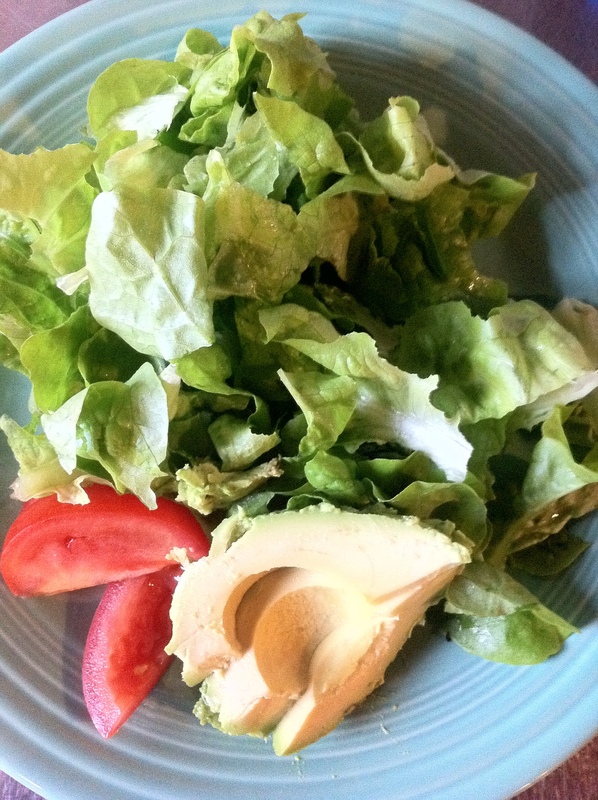 This entry was posted in Beef and tagged Beef, cooking, Filet mignon, food. Bookmark the permalink. Allspice, three farm eggs, a kilo and a half if mince, salt and pepper. Beef broth and some cream. 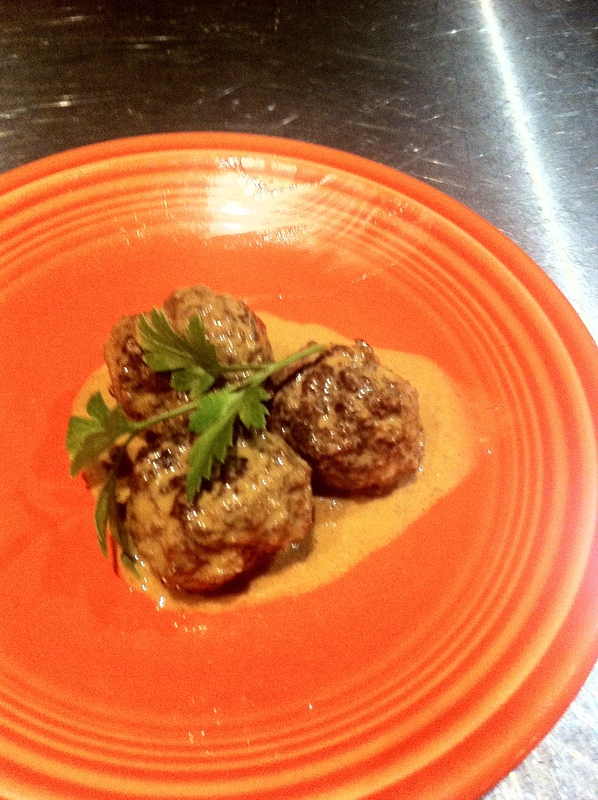 This entry was posted in Beef and tagged Beef, cooking, food. Bookmark the permalink.